Jimmy... you know the drill... you can get rid of the other 2... and just use this one! Jimmy... I forgot to mention that you can change A Nightmare on Elm Street 3: Dream Warriors review links to point to just this one as well. The movies I ordered this month let me add 10 more movies to the list in the first post! The general premise of the show is that a group of children are pulled into the "Realm of Dungeons & Dragons" by taking a magical dark ride trip on an amusement park roller coaster. Invariably, the children try to return home, but often take detours to help people, or find that their fates are intertwined with the fate of others. Dungeon Master decides to send the group on a quest to destroy an evil beholder who has ruined a landscape. Fortunately for the group, a knight named Sir John is in the vicinity and he may be able to assist them with their endeavor, though they discover that Sir John may not be as skilled as he had claimed he was. OK... I enjoyed this episode a little more then the first one. Though this toon still isn't as good as I remembered it being. Funny thing though... it has been many years since I seen this cartoon. But from the moment I saw the character of Sir John I vividly remembered this episode. I must have seen this episode many times when I was a kid. Mrs. Garrett and the girls travel to Paris, France. Mrs. Garrett will be tending a cook school, while the girls will be attending the sister school of Eastland. During their journey across the world, Mrs. Garrett has a hard time adjusting to the work, and her boss. This is a TV Movie that came with The Facts of Life: The Complete Fourth Season. It originally aired just a few days before the fourth season. While this movie has a bit of a slow start... it picks up a bit once they get to Paris. Unfortunately it only picks up a little. There wasn't any real laughs in this movie. But I did still enjoy seeing the cast in different surroundings. I am sure I will watch the episodes more often then this movie... but I can see myself watching it every now and then. Well... I didn't watch a single movie last weekend. And the weekend before that everything I watched there was already reviews up for them... so I just had you update the links. 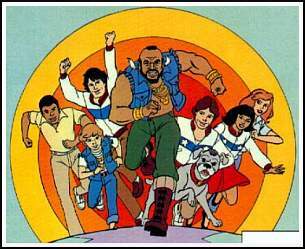 Mister T was an animated series that aired on NBC from 1983 to 1986, with a total of 30 episodes produced. Created by Ruby-Spears, the cartoon starred Mr. T as a coach to a gymnastics team, travelling the world while becoming involved in and solving various mysteries. 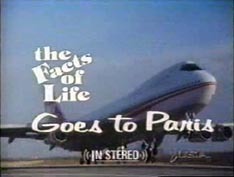 At the beginning of each episode, a live-action introduction featuring Mr. T himself is shown to explain what is going on. At the end of each episode, Mr. T narrates a moral lesson for the audience. The gymnastics team welcomes a new member, while a mysterious group of men is stealing golden medallions to search for something hidden in one of them. The gymnastics team takes off to investigate things in San Francisco. I remember seeing this cartoon back in the '8os... but what I couldn't remember is if it was any good or not. But I enjoyed it. It is an entertaining show. The quality of this print could have been better. There was some dust in the image here and there... as well as a bit of a shaky picture for a brief moment once or twice. But it was definitely watchable. If they were to release this series I would consider getting it if it was at a low enough price. But it isn't something I would rush out for. I always found this movie to be a lot of fun. Geena Davis was great in the role. And even though I don't normally care for her... I also enjoyed Winona Ryder. While this is a movie I like to watch a lot... so I am thrilled to have this Anniversary Deluxe Edition DVD. Though I am not sure that this release deserves such an edition. I mean how can you call this a deluxe edition? The fact that they added a few episodes of the animated series is cool... and then there is the theatrical trailer but where are the extras that more people want to see? There is no Commentary? What about a Featurette or two? Blooper Reel? Nope... we don't get none of that. Talk about a missed opportunity! Oh well at least it is a movie I really enjoy... and there is a few episodes of the animated series... which I haven't seen any of in a very long time. The premise of the animated series was greatly changed from the film, to the point where one only superficially resembled the other. 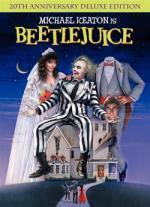 In the film, Beetlejuice was the antagonist, who ended up nearly marrying a disgusted Lydia; in the series, they are best friends, and Lydia, something of a social misfit in the living world, frequently visits him in the afterlife during her free time. The skeletons in Beetlejuice's closet have accumulated so much over the years that the closet finally bursts. The skeletons drift astray, telling people the truths Beetlejuice had always hidden from them. This series started in 1989... luckily for me one of the ones on the above dvd is from that season so I could add it to this marathon. This is the first time since they originally aired that I seen one of these episodes. And I must admit... even though it really is nothing like the movie... the show is a lot of fun. So much so that Britt and I decided to watch all 3 episodes that is on the above disc.This is one show I would definitely buy if it was ever released on DVD. I always did like the Beetlejuice cartoon. I saw that before I first saw the movie. Oh No! what am I going to do! My number is already so low!